Love Starbucks Pumpkin Spice Lattes, but hate the calories, price tag, and FIFTY grams of sugar? 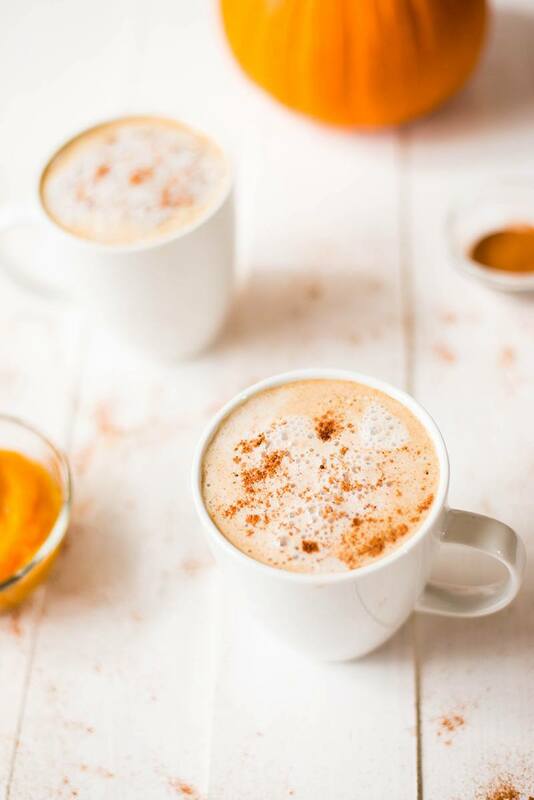 Follow these easy instructions and make a delicious and healthy homemade pumpkin spice latte year round! I’m a huge fan or turning the recipes I love into healthy, guilt-free recipes. Because, let’s face it, I like to eat, and I like to not feel guilty. I also like to be healthy. When I can get these 2 loves together (1-eating and 2-being healthy), it’s the stuff of magic. I’ve reworked strawberry shortcakes, chocolate pudding, peanut butter cups, lemon bars, cheesecake, and so many more. Each time, my focus is on maintaining the flavor and enjoyment factor of the food but finding ways to remove refined sugars, oils, fats, and so on. So, naturally, it was time for me to take a look at my pumpkin spice latte recipe. Because a healthy pumpkin spice latte that’s just as good as a Starbucks pumpkin spice latte would just let me win at life. Never made homemade pumpkin spice latte? 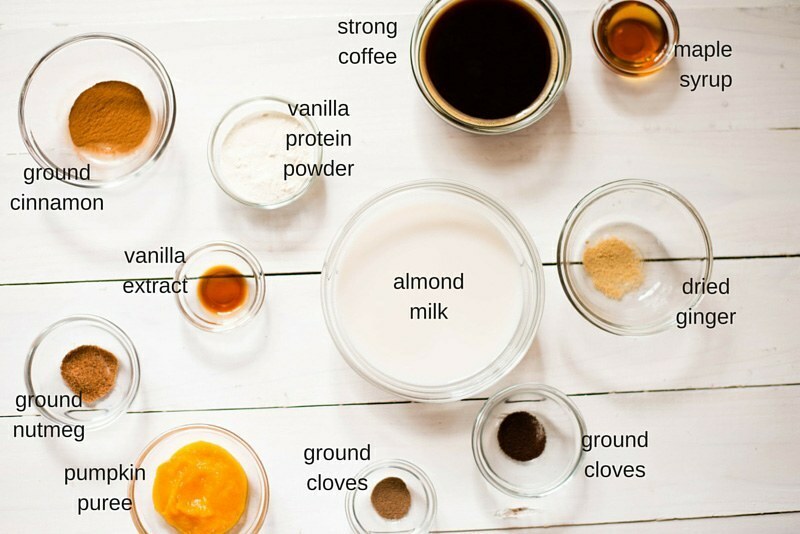 DIY pumpkin spice latte is very easy so you don’t have to worry. 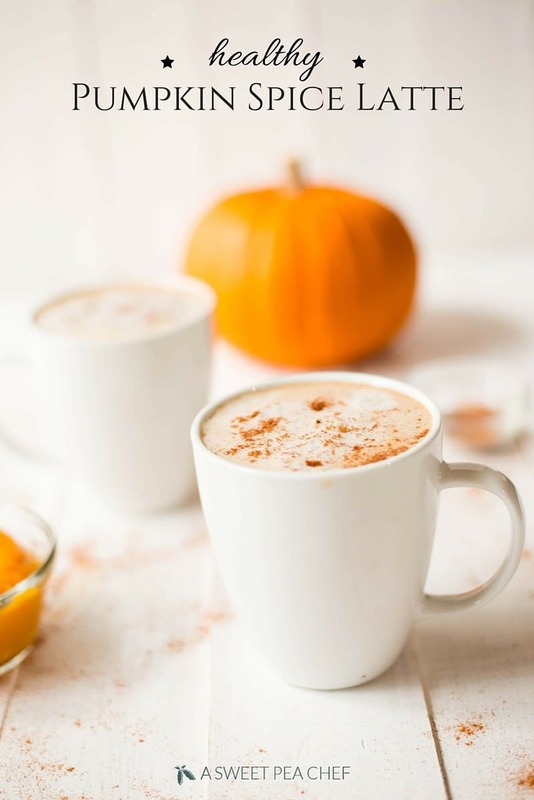 This healthy pumpkin spice latte will allow you to welcome Fall with open arms every year. 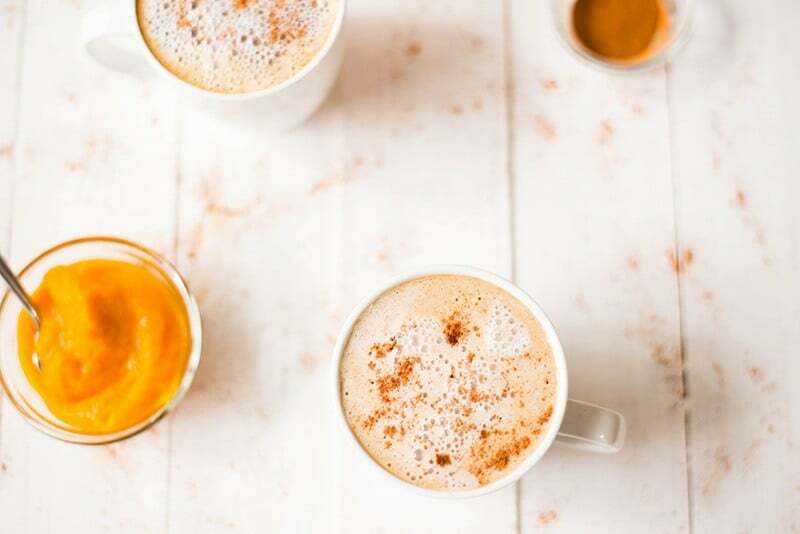 I know you love to have options so this healthy pumpkin spice latte recipe comes with 3 options. In this way, you get to enjoy your pumpkin spice latte just the way you like it. 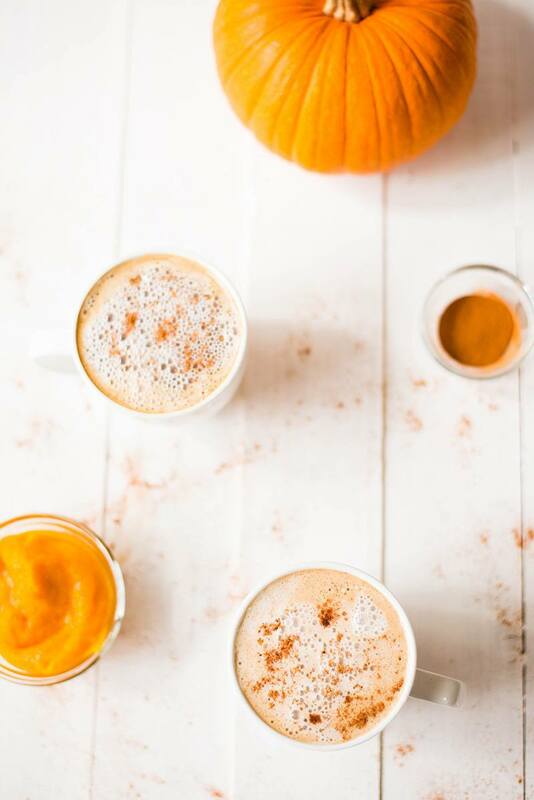 You can make regular pumpkin spice latte, vegan pumpkin spice latte, or iced pumpkin spice latte. There’s really not a big difference between making a regular pumpkin spice latte and a healthy pumpkin spice latte. Not in technique anyway. And the good news is you don’t need an expensive espresso maker. <— Although, they are pretty and fancy! I replaced the brown sugar with pure maple syrup which is a clean, unrefined sweetener (and because I kinda got a thing for maple syrup). More on refined sugars here if you’re interested. I replaced the cream with unsweetened almond milk and vanilla protein powder. The protein powder creates a frothy texture when emulsified with the almond milk using an immersion blender, plus adds a ton of protein which is just awesomeness. If you don’t have an immersion blender, you can use a sealable jar (like a mason jar with a lid) to shake the milk and protein powder into a foamy texture. Instead of using a high sugar syrup for the pumpkin spice flavoring, I used dried spices. A pumpkin spice latte from Starbucks has 420 calories, 14 grams of protein, 0 grams of fiber, 50 grams of sugar, and 18 grams of fat! No, thank you. That’s enough calories for an entire meal and waaaay more sugar than anyone needs in one sitting. 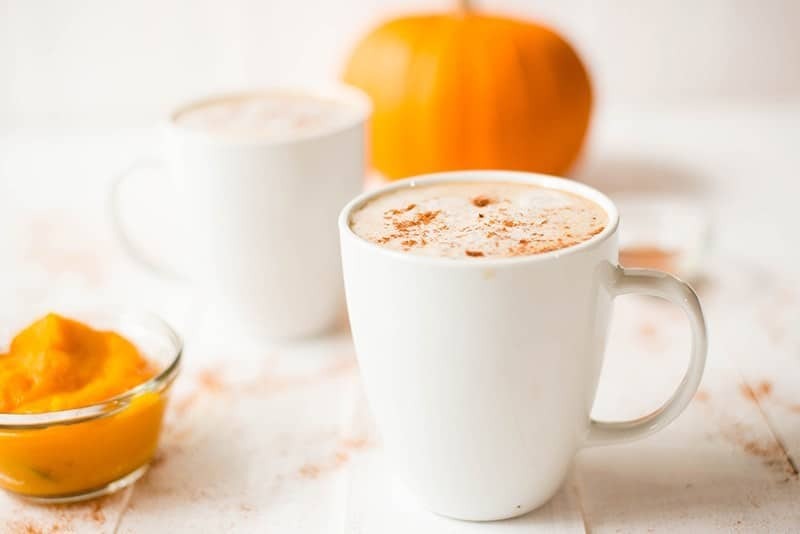 What about this healthy pumpkin spice latte? Now, you can totally make a pumpkin spice latte at home without an espresso maker, not pay a ton of money at Starbucks, and have a delicious, pumpkin latte this Fall (or any time of the year!) Plus, you can change up how much coffee you add to your recipe and whether it’s caffeinated by easily adjusting the amounts and type of coffee. I get this question A LOT, especially during this time of the year. So, what’s in pumpkin spice? Pumpkin spice is a blend of ginger, cinnamon, nutmeg, cloves, and, most of the time, allspice. While you can buy pre-blended pumpkin spice, I prefer to make my own homemade pumpkin spice. The best thing about making your very own pumpkin spice recipe is that you can adjust the spices to suit your taste. For example, in this pumpkin spice coffee recipe you can add more cinnamon and less ginger. Or more nutmeg and less cinnamon. 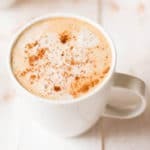 The only ingredient in this recipe that isn’t vegan is the protein powder which you can easily fix by choosing a vegan protein powder of your choice to make this a vegan pumpkin spice latte. Also, as written, this recipe is gluten-free, high protein, and low carb. And, if (like me), you are okay with calling protein powder “clean-ish,” then this is a clean pumpkin spice latte for ya, too. This is another question I get A LOT. Unfortunately, protein powder, while useful in adding lean protein into your diet, can often get extremely processed and carry a lot of refined ingredients and chemicals. My advice is to look for protein powders that have a very short list of ingredients and do not include any artificial sweeteners, if possible. The list below of healthier protein powders are the ones I’ve found to contain the least amount of ingredients PLUS taste good. Orgain Organic Plant Based Protein Powder – this vegan protein powder is a mix of organic pea protein, organic brown rice protein, and chia seeds protein. For my healthy pumpkin spice latte recipe, I recommend using the vanilla flavored one but this vegan protein powder has other flavors available including Chocolate Peanut Butter, Vanilla and Cookies & Cream. ALOHA Organic Plant Based Protein Powder – a mix of pea protein, hemp seed protein, and pumpkin seed protein, this vegan protein powder contains no additives and it is sweetened with coconut sugar. This protein powder comes in 4 flavors: vanilla, banana, mixed berry, and chocolate. Yuve Vegan Protein Powder with Superfoods – this protein powder includes whole chia seeds plus other healthy ingredients that are good for you. And you have 2 options to choose from – vanilla and chocolate. Pumpkin spice latte, and any latte for that matter, is a mix of coffee, milk, and milk foam. Texture perfection, if you ask me. And this healthy pumpkin spice latte with almond milk is no different. Use an immersion blender or a sealable glass jar that can be microwaved. Pour the almond milk into the cup of the immersion blender or in the jar. Use the immersion blender for approximately 30 seconds on the almond the milk to allow it to get a little bubble. If you use a sealable jar, shake the almond milk vigorously for 30-45 seconds with the lid on tight. Place the almond milk into the microwave. Heat on high for 30-40 seconds. Repeat these 2 steps a second time until the almond milk is nice and frothy. Pour the coffee and pumpkin mixture into a mug. Hold back the milk foam with a spoon and carefully pour the steamed almond milk into the mug. Spoon the foam over the top. Most of the days, I like my pumpkin spice latte hot. However, there are days when I prefer it iced and refreshing. Pour the pumpkin mixture over ice. Pour the almond milk and add the foam as I explained earlier. Yes. It’s just this easy. I know Fall is all about pumpkin spice coffee recipes, but in a true coffee lover fashion, I have to talk to you about other coffee recipes. And I really don’t want you to go out and buy an expensive coffee drink that’s not good for you when I have these healthy coffee recipes I can share with you. Ok, 2 of these coffee recipes are for coffee drinks. The 3rd one is for coffee ice cream. Which, in my book, means that this coffee recipe list is the perfect list for when you want to satisfy your sweet tooth cravings and coffee cravings while maintaining a healthy lifestyle. Let’s begin this list with a Healthy Coffee Smoothie. Just as my pumpkin spice latte, this coffee smoothie is healthier than the sugar-filled coffee drinks you can buy at a coffee house. 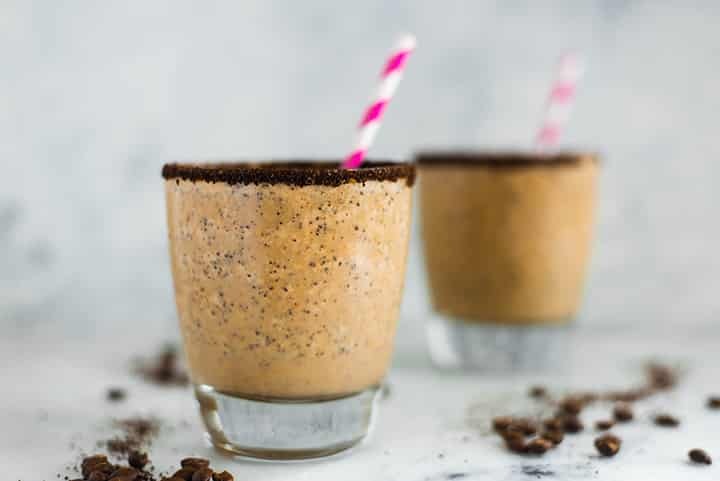 Ready in 5 minutes and perfect for busy mornings, this coffee smoothie is breakfast and coffee in one drink. Get the recipe. 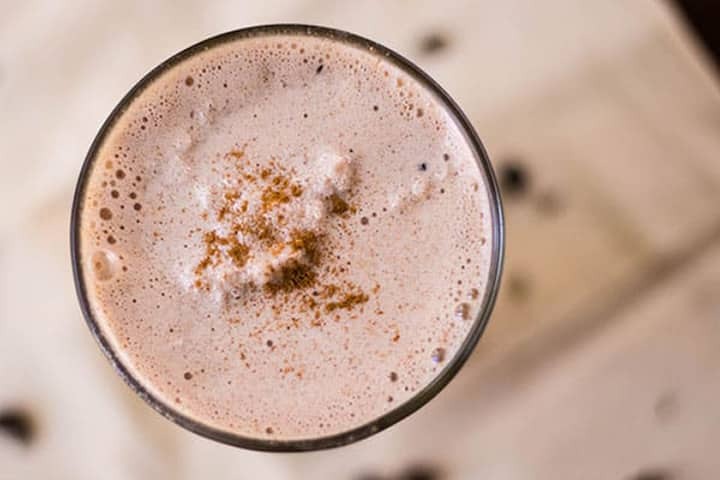 Another breakfast-perfect coffee recipe I want to share with you is this Almond Butter, Chocolate & Coffee Bean Protein Shake recipe. This recipe includes 2 of my favorite things – coffee and almond butter. And it’s yummy and easy to make. Get the recipe. Now the Coffee Ice Cream recipe I teased you with. 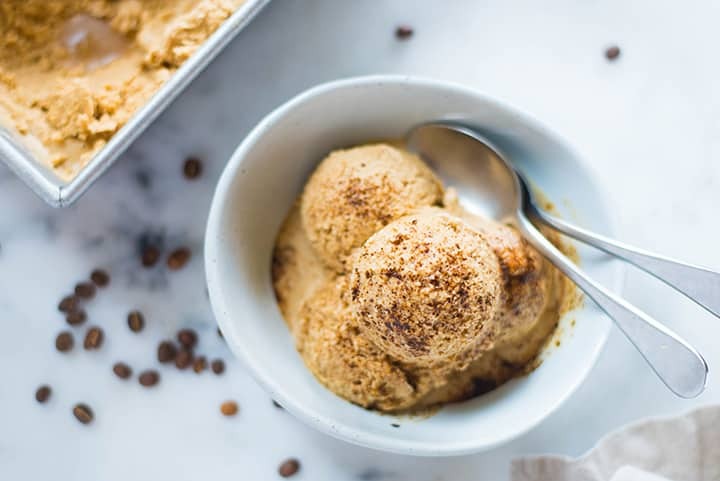 Healthy, dairy-free, vegan, paleo, and gluten-free, this coffee ice cream is coffee and ice cream deliciousness. Not to mention making this ice cream is super easy and you won’t even need an ice cream maker. Get the recipe. Love Starbucks Pumpkin Spice Lattes, but hate the calories and price tag? Follow these easy instructions and make a delicious and healthy homemade pumpkin spice latte year round! To make steamed milk without an espresso maker, I like to use my immersion blender and it has a handy little measuring cup that came with it. If you don’t have an immersion blender, you can use a sealable glass jar that can be microwaved. * To make strong coffee, add 1.5 - 2 times the amount of coffee you'd regularly use in relation to the water. « Sweet Potato Hummus | Vegan, GF and Paleo! Is there a substitute I could use for the Vanilla protein powder? Yes, any protein powder would work or you could leave it out entirely, if you’d prefer, but it wont be quite as frothy or have as much protein.